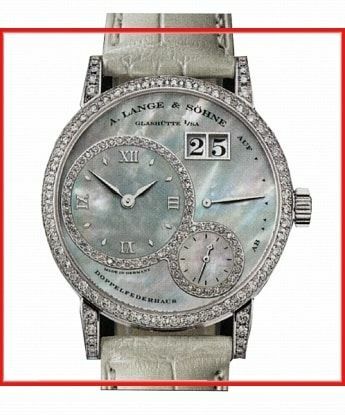 This lovely A. Lange & Söhne Lange 1 813.044 ladies watch is the perfect gift for the beautiful woman with style. Watches for women like the A. Lange & Söhne Lange 1 813.044 are the right choice for every lady. The appealing female design flatters the eye and attracts attention for the wearer. This object belongs to the category of watches that make women’s hearts beat faster. Women like to buy this gem themselves, but are even more happy if you get this ladies watch as a gift. The face of this womens watch has Mother off pearl and the bezel is . This ladies watch comes with a Power reserve display, Half-oscillations A/h 21600, Calibre, Mechanical manually wound movement movement. The Aligator strap black bracelet completes the picture of this unique ladies watch. The functions of this luxury ladies watch include Big date, Hour minute. Find more ladies watches in the ladies category. This womens watch has the product status New and is instock. If you order this copy, the watch is delivered with Original Box and with Original Papers. Of course, all our new watches come with the corresponding manufacturer warranty. Take a closer look at our A. Lange & Söhne luxury watch. You will quickly see why it is one of the bestsellers in our extensive range of women’s luxury watches. Discover the world of A. Lange & Söhne watches and learn more about A. Lange & Söhne on the Manufaktur Webseite. Take a look at our other exclusive luxury watches and see why A. Lange & Söhne and other watch brands are so seductive. Rattapante is a leader in the online luxury watch market. From new, unused to used watches, we offer only the highest quality watches, including the A. Lange & Söhne Lange 1 813.044.